An upcoming Xbox Live release event includes a group of titles highly sought after by the gaming community. When Microsoft finished announcing it sold 8 million Kinects and revealing its new Avatar Kinect chat system at the ongoing CES 2011, it put out a press release detailing a slate of new Xbox Live Arcade releases. Starting on February 16, 2011, the XBLA House Party release event will feature five straight weeks of exciting titles, some long awaited by fans. The House Party kicks off with Hard Corps: Uprising, a spiritual prequel to Contra: Hard Corps by Arc System Works of BlazBlue and Guilty Gear fame. 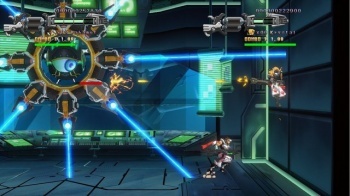 Hard Corps: Uprising combines the beautiful 2D visual style Arc is known for with the fast-paced action of Contra, but also includes an intriguing RPG-style mode that gives players a life bar and has them purchasing items and upgrades to build up their soldier. Following Hard Corps in an undisclosed order will be the XBLA releases of Torchlight, Beyond Good & Evil HD, Bejeweled Blitz Live, and Full House Poker. Not to put down Bejeweled Blitz or Full House Poker, but Torchlight and Beyond Good & Evil HD are the notable games in the bunch. Ubisoft's Beyond Good & Evil was developed by Rayman creator Michel Ancel and released in 2003 to incredible critical praise, but a lack of commercial success. Its cult-hit status has kept it alive through platforms like Steam, but Beyond Good & Evil HD could be the game's ultimate version with remastered visuals and sound, and the addition of trophies/achievements (as the game is also planned for the PlayStation Network). Runic Games hoped its hack-and-slash RPG Torchlight, which has already sold 800,000 copies on the PC, would be out on XBLA by the holiday season of 2011, and it hasn't strayed too far off that mark with the inclusion of Torchlight in the XBLA House Party. 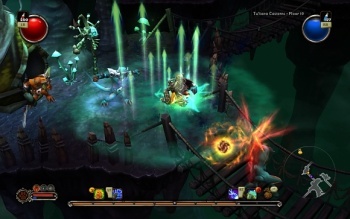 Torchlight won gamers' hearts through its mish-mash of Diablo-style gameplay with the best of other titles like Mythos and Fate. The XBLA version of Torchlight will feature revamped controls and mechanics, new armor and quests, an exclusive new pet, and some kind of "goodie" sharing system for Xbox Live friends. And if you like PopCap's addictive brand of gaming, the XBLA version of Bejeweled Blitz likely won't steer you wrong. Full House Poker is coming out of Krome Studios and features quick two-player games, 30-player tournaments, and an avatar customization system so players can fake each other out with chip tricks and tells. It might be worth looking at for the Texas Hold 'Em crowd. Prices and specific release dates for the XBLA House Party titles have yet to be announced.